Instead of stained glass, I prefer to cut small pieces from recycled glass mosaic tile, which cuts much more cleanly with less waste because it is made by fusing glass powder, which results in a more homogeneous composition. Swirled stained glass might generate more waste and odd sharp slivers because it breaks along the veins of the swirls, but there are reasons to use it in spite of the scrap. For starters, stained glass is more sparkling than recycled glass tile because it is semi-translucent AND it has interesting variegated colors. Besides, for micro-mosaics, you only need a tiny amount of material, and so waste isn’t a problem, especially if you save it for glass fusing. Micro-mosaic pendant by Adam Sprague before grouting. 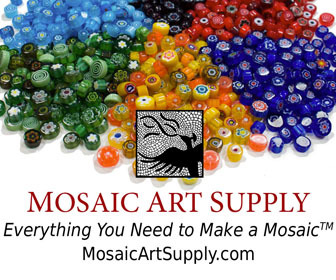 All glass for mosaic work can be cut with a Mosaic Glass Cutter, which is sometimes called a Glass Nipper, or but always means a pair of pliers with wheel-shaped blades. Note that this is a different tool from the ordinary Tile Nipper, which is only used on ceramic tile and not all the different forms of mosaic glass. In the video, Teneisha and Adam used the standard indoor mosaic adhesive, Weldbond, which is a white PVA of highest quality. Weldbond isn’t the best adhesive for bonding to metal, and so the sophomoric technical type of person might recommend a typical fast-drying solvent-based jewelry adhesive, but these have extremely toxic fumes and don’t have the working time required for any type of piece-by-piece mosaic work. Having a water-proof, metal-grabbing adhesive isn’t nearly as critical as it might seem. 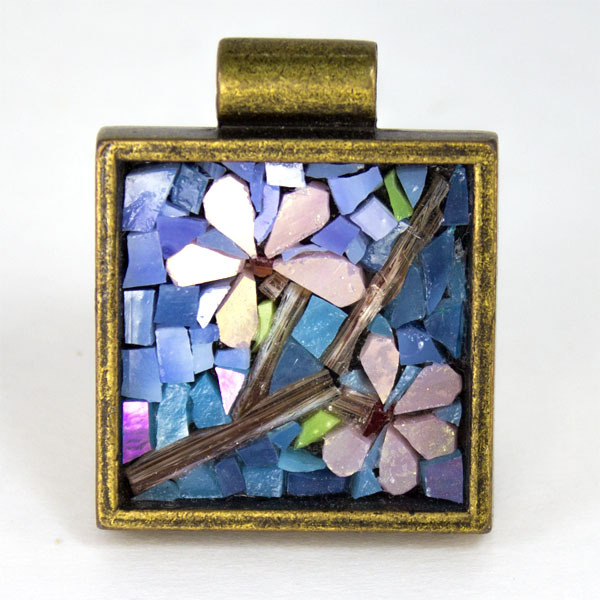 Micro-mosaic jewelry isn’t grouted with normal sanded grout. Instead, Adam used artists acrylic paint in black to “grout” his mosaic pendent in the usual “wipe-on-wipe-off” method. No matter the size of the mosaic and no matter what material is used to “grout” it, the “wipe-on-wipe-off” method should always include ample pressing of the wet grout down into the gaps before wiping it off. Work it back and forth numerous times before wiping off the excess. Otherwise, there will likely be some gaps that are only superficially covered and hollow inside, ready to be exposed at some later time. The brass pendant selected for this project has a deep bezel, which is critical for accommodating glass that is nominally 1/8 inches thick. Talk on social media recommended HHH Enterprises as a source of deep-bezel jewelry findings, but we haven’t actually purchased from there and would appreciate any customer feedback if you use their products. 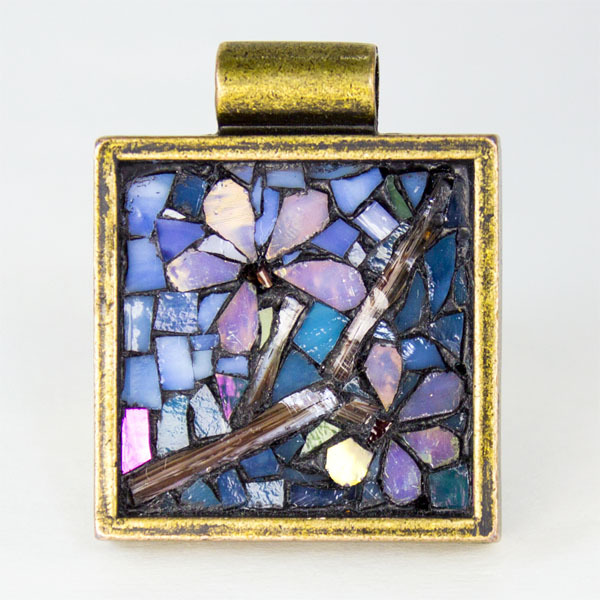 Micro-mosaic pendent by Adam Sprague, grouted. Which glue did you use? Weldbond? Others have recommended epoxy glues. Any good sources for deep jewelry bezels? Know of any in Sterling? Thanks. Really liked your video.